Poblano Chili Soup, made with red lentils, at Fogwood & Fig, a vegan cafe in Port Jervis. Eschewing all meat and any animal-derived ingredients, vegans receive all their sustenance from plants—vegetables, fruits, herbs, nuts, and grains. For several decades, a vegan diet was viewed as a Spartan rebuke of mainstream cooking, brimming with self-righteousness. Modern plant-based cuisine is anything but Spartan—inventive, creative and full of flavor, a sort of introductory primer on global food traditions that employ vegetables and other plant offerings as their nutritional mainstay. Globalization has familiarized products in most American supermarkets that 30 years ago were nearly impossible to locate: coconut milk, fresh lemongrass, shitake mushrooms, poblano peppers, ginger root, rice vinegar, and sesame oil. Some of the best purely vegan restaurants in the Hudson Valley apply multicultural food traditions; dining at one of these eateries often feels nuanced and sophisticated. Food inspirations might be exotic, but food philosophies at most vegetarian places are predominantly local and organic. In the summer season, vegetables, fruits, and herbs are sourced directly from local Hudson Valley farms or farm markets. Local produce has the bonus of incomparable flavor, just-picked ripeness, and a taste of terroir. In the winter, proprietors are sourcing local grains and whole wheat bread flour, maple syrup, cashew ice cream, potatoes, root vegetables, and apples, so that the dining experience is still redolent with local flavors. The myriad reasons people opt for a plant-based lifestyle: health, ecology, animal rights, nonviolence, religious beliefs, or any combination of these reasons might have formerly smacked of the sanctimonious, but in light of today’s global health and environmental crises, a vegan lifestyle might just be a flavorful, curative option available to everyone. Vegan restaurants are cropping up all over the Hudson Valley (as are vegan options on omnivorous menus). Here are 4 purely vegan restaurants to eat a delicious plant-based meal that will leave you with a clear conscience and a happy belly. A vegan burger bar might seem an oxymoron in an area dotted by rolling farmland where pastured cows, pigs, chickens, and ducks become key ingredients in many farm-to-table menus. But that is exactly the vision that Bobbi Jo Forte, Bonnie Schweppe, and Martin J. Pucino had when they conceived of the plan for Wildflower Cafe in Red Hook: a fully vegan burger bar, offering meat alternative dishes as well as dairy-free “milkshakes” and cheeses for a full burger joint experience. Both the dine-in and take-out menus at their WildFlower Cafe include two kinds of “red-meat patties;” fish, chicken, frankfurter, and bratwurst imitations; nondairy shakes; fries and onion rings; traditional condiments; some sauces; and soft drinks. They recently added beer and wine to the menu. 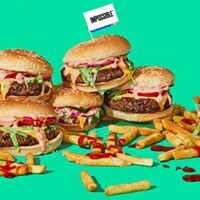 The Impossible Burger, made with wheat and potato protein, can be cooked rare, medium, or well-done and “bleeds just like meat,” according to Forte. Alternatively, order the Beyond Meat pea-protein-based burger. In May, Diana Bezanski, founder of the hit food blog Fogwood & Fig, opened up a new vegan cafe on Front Street in Port Jervis. Serving up plant-based comfort food, ranging from Korean BBQ to lentil soup, Fogwood & Fig is a long-awaited beacon on the hill for the vegan foodies in the region, its arrival heralding a new era in conscientious dining Upstate. That they do. The Whiskey Burger, for example, constructed of caramelized whiskey onions, avocado, house pickles, arugula, and smoky, tangy cashew aioli, served with a shepherd’s lentil stew over garlic mashed potatoes with house yogurt, herbs and hot sauce. Karma Road and its chef/owners Jennifer Branitz and Seth Davis wear their culinary heart on their sleeve. Their shingle reads: “Food for an Inspired Planet” and the take-out menu states: “Healthy Delicious Food for Everyone.” Karma Road has its fans, thanks for its consistently quick, delicious, unfussy preparation and clear labeling. They list all the ingredients either on the blackboard or on staked signs in each prepared dish in the display case. “A no-brainer,” she says: the Young Coconut Shake, a dreamy concoction of young coconut meat, water, agave, and vanilla, coupled with the Karma Reuben sandwich of roasted tempeh, sauerkraut, and homemade Russian dressing and the “addictive” Kalecado salad—raw kale with creamy avocado mash, onions, extravirgin olive oil, carrots, lemon juice, raisins, and cashews. Another standout: the Baked Falafel Wrap with carrots, tomatoes, lettuce, tahini, and added hummus. It tasted “clean, crisp, and fresh” to Olivebridge organic farmer Thom Greaney, who recognizes a fresh vegetable when he tastes one. The accompanying Sprouted Raw Red Lentil Salad (ingredients were listed as: celery, red pepper, red onion, parsley, canola oil, lemon juice, Bragg’s Aminos, garlic, black pepper, sea salt, seasoning—celery salt—and love) was refreshing. Dessert: a just-out-of-the-oven chocolate blueberry muffin baked from spelt and brown rice flour and sweetened with agave, maple syrup, and cane sugar. The Garden Café on the Green in Woodstock is vegan, but quietly so. The restaurant’s shabby-chic décor is at once elegant and cozy. 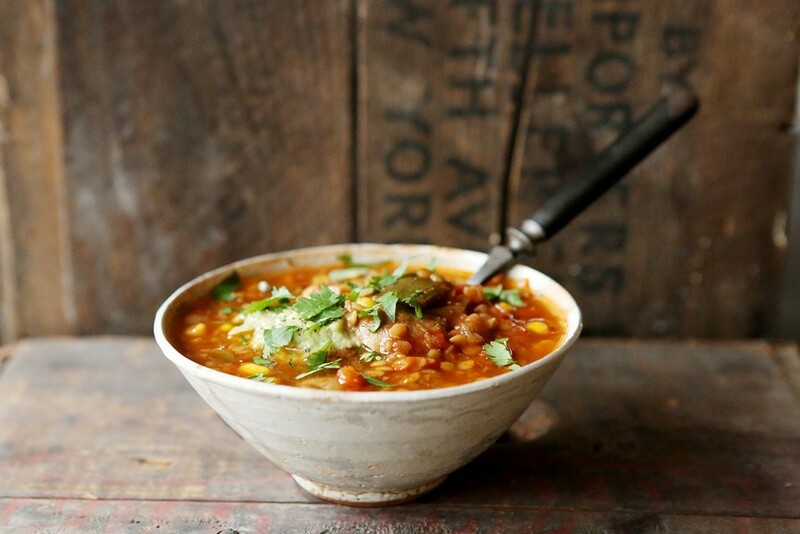 Under Chef Christine Moss, the menu features inventive dishes, excellent preparation, and creative use of world spices that combine to deliver delicious vegan testaments to a cuisine and a lifestyle that can be as tasty as it is nutritious and compassionate toward animals. All the ingredients are organic, GMO-free, and locally sourced whenever possible. The menu is dynamic, inventive, and playful, offering variations on Thai, Indian, Afghani, Italian, and American Southwestern cooking. The menu changes seasonally and specials are offered daily, so choosing just one dish to recommend becomes particularly difficult. Last week, the specials ranged from seitan tacos with creamy jalapeño slaw to butternut squash and leek polenta with sauteed greens. Breakfast is served daily until 1pm and features hearty, tasty dishes like huevos rancheros, made with scrambled tofu, avocado, black beans, or if you have a sweet tooth—whole grain french toast with seasonal fruit compote and local maple syrup. Want to spice it up? Add a side of vegan sausage, Fakin Bacon, or sauteed kale. The Garden Cafe also has an organic juice and smoothie bar, as well as a full wine and beer list, and chef Moss regularly makes vegan cheeses in-house like the recently released cashew, peppercorn, and basil brie. Who said eating vegan meant giving up life's indulgences? In May, Diana Bezanski, founder of the hit food blog Fogwood & Fig, opened up a new vegan restaurant on Main Street in Port Jervis. Serving up plant-based comfort food is the long-awaited beacon on the hill for the vegan foodies in the region, its arrival heralding a new era in conscientious dining Upstate.